Denmark and Switzerland are small and successful countries with exceptionally content populations. However, they have very different political institutions and economic models. They have followed the general tendency in the West toward economic convergence, but both countries have managed to stay on top. They both have a strong liberal tradition, but otherwise their economic strategies are a welfare state model for Denmark and a safe haven model for Switzerland. The Danish welfare state is tax-based, while the expenditures for social welfare are insurance-based in Switzerland. 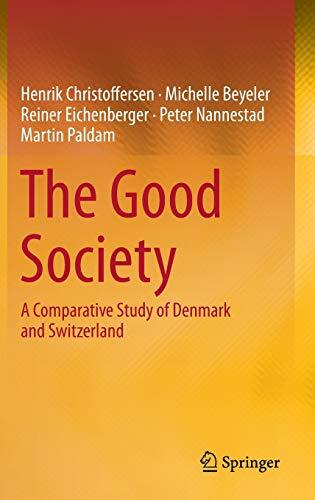 The political institutions are a multiparty unicameral system in Denmark, and a permanent coalition system with many referenda and strong local government in Switzerland. Both approaches have managed to ensure smoothly working political power-sharing and economic systems that allocate resources in a fairly efficient way. To date, they have also managed to adapt the economies to changes in the external environment with a combination of stability and flexibility. Henrik Christoffersen is an associate external Professor in economics at the University of Copenhagen and Director of research at the Copenhagen Center for Political Studies, Cepos. Michelle Beyeler is a senior researcher and lecturer at the Political Science Department of the Universities of Bern and Zurich. She is a political scientist and her research covers various topics such as comparative welfare state analysis, gender and politics, comparative political economy, and political protest. Reiner Eichenberger is Professor at the University of Fribourg for Public Finance and Economic Policy since 1998. He got his doctorate (1991) and habilitation (1998) at the University of Zurich. He specializes in Political Economy and Institutional Innovations, and is a co-editor of Kyklos. He published more than 100 academic articles and a large number of contributions in outlets for the general public. Peter Nannestad is Professor of Public Policy at the Department of Political Science at Aarhaus University since 1991. Martin Paldam is Professor of Economics at the Department of Economics and Business at Aarhus University, Denmark.